and I'm a collector of pencil sharpeners. to trade sharpeners with me. This is a picture of myself when I was a little bit younger. I work as female postman in my home town Doetinchem. My collection is one of the greatest in my country. About 28 years ago my cousin gave me my first sharpener. That was the beginning of my collection. In 1987 I started a pencil sharpener club called PUNTGAAF. At this moment the club has 125 members, which 120 from Holland and 5 from Belgium. while other prefer metal or stone. Other members are generally interested in all types of sharpeners. We frequently exchange sharpeners or visit each other. We also inform each other about any new sharpeners as they appear. Since there are no books or catalogs about sharpeners in Holland, all replies are welcome. had copied the idea. But ten years ago these two factories closed. but with more plastic on it. In 1828 Bernard Lassimone ( a mathematician in Limoges ) ask for a patent ( French patent 2444 ) on an object to sharpen pencils. Other French patents - Mayet in 1842 - pecaut in 1852 and Rottger in 1866. 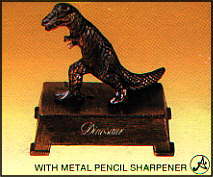 And in 1847 Therry des Estwaux invented the pencil sharpener.